An eye surgery team credited with some of the best safety rates in the country has been praised for bringing waiting times down to just seven weeks for patients needing cataract removals. 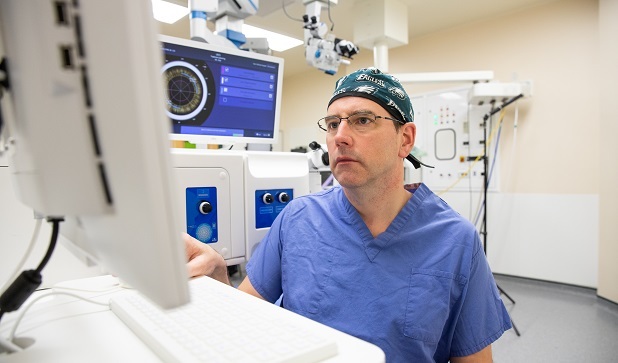 The dedicated team at Hull Eye Hospital sees around 5,000 patients a year for cataract surgery, caused as people grow older and the lens inside the eye becomes cloudy, affecting vision. Cataract surgery, which replaces the cloudy lens with a clear, artificial lens, is the most common operation performed in the UK and Hull has one of the lowest rates of complication in the country. Now, despite treating around 100 patients in need of cataract surgery every week, the ophthalmology team has almost halved waiting times from around 12 weeks to just seven. Consultant ophthalmologist Colin Vize said: “Everyone from our reception staff to the people in our appointments team and the clinical staff carrying out the procedure has worked so hard to get people seen as quickly as possible. “The national standard is 18 weeks but we’re seeing patients far sooner for their first appointment. “The vast majority of our patients see the consultant for their first appointment within seven weeks of being referred to the hospital by their optician. “Most operations are then done within five weeks, meaning the whole process from initial referral to surgery is completed within 12 weeks. People are able to choose which hospital they wish to carry out surgery. However, Mr Vize said Hull’s highly skilled team and short waiting lists mean people in the city and surrounding towns and villages in the East Riding can benefit from high-quality health care on their doorsteps without the inconvenience of travelling further afield. Cataract surgery, like all forms of surgical intervention, carries risk and the most common complication is “posterior capsule rupture”. The complication is used by the Royal College of Ophthalmology as a way of measuring the quality of cataract surgery at different hospitals. Although PCR happens to one in every 150 patients nationally, just one in 400 patients will experience the complication in Hull, making Hull Eye Hospital one of the safest places in the UK to undergo the operation. Mr Vize said: “We’ve got a fantastic service to offer local people so there’s no need for anyone to travel anywhere else in Yorkshire. Be the first to comment on "Hull Eye Hospital one of safest in UK for cataract surgery"